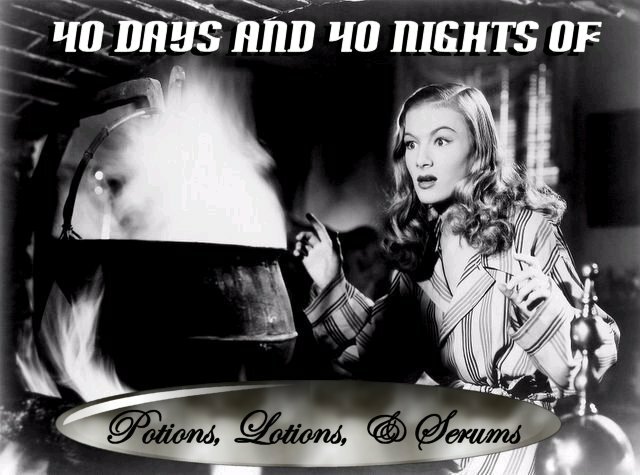 It seems like just yesterday that we started our 40 In 40 Skincare reviews. I'm pretty sure back then we had a few feet of snow on the ground, and we were weary of Winter and what it did to our skin. I've gone through so much lotion, so many jars of creams, and even the husband has been dipping into the lotions I have sitting on the shelved in the bathroom. He likes an Italian body lotion I found on a markdown rack at TJMaxx. That is way better than the time he "liked" my Chanel Creme Extreme Protection and used up the entire tube. I gotta give him credit for knowing a good product when he uses one! But as I write this, on a beautiful, sunny, warm, glorious Spring day, with daffodils swaying gently in the breeze, forsythia popping yellow all over its branches, and the star magnolia in full bloom, I'm hoping I can finally put away some of the heavy-duty skin-savers of the last few months, and move on to the things I'd stored away back in the Fall. The first thing I took out of storage was this little aqua bottle from L'Oreal. 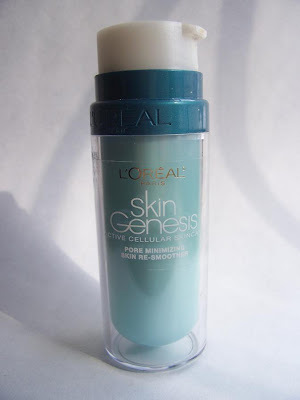 It's called Dermo-Expertise Skin Genesis Active Cellular Skincare Pore Minimizing Skin Re-Smoother. That's a very big name for a little one-ouncer. It promises tightened, smaller pores, smoother skin, and retexturizing. Who wouldn't want all of those things? I'm on my second bottle. Skin Re-Smoother is a lightweight gel-lotion that feels refreshing and cool on the skin, and dries almost instantly to a super-matte finish. L'Oreal would like you to use this morning and night under your moisturizer. I had thought of it as a temporary pore-tightening pore-minimizing product and not a treatment for those problems. It didn't occur to me that if I used it morning and night, maybe those problems would actually diminish over time, and not just when I had this product on my face. And so that is what I'm planning to do. I'll report the results after I try this for a few months. A matte surface was not what I would ever want in the dry-skin months of this bad Winter. But now with warmer weather, I will have the same old problem I have had for years, which is why I purchased and used up a bottle of Skin Re-Smoother last Summer. A lifetime of super-oily skin left me with huge pores. Most pore-minimizing products work better on oily skin, but that's not me anymore, post-menopause. So herein was the dilemma. I noticed on the box that one of the ingredients is hyaluronic acid. I know that this ingredient attracts moisture to the skin, so I hoped it would help with the dryness while the "pore-targeting technology" would do its magic. The formula also contains denatured alcohol, some silicones, glycerin, and salicylic acid. Sounds like the product is confused! But I was happy to see real, visible results in the pore areas, definitely seeing smaller pores and a nice tightening effect around the nose-cheek area. The only objection I have to this product is that it has a slight whitish cast on the skin. And I definitely do need to wear a lightweight moisturizer over it. Just knowing that I have brought out this product that I only use in warmer weather has lightened my spirits as much as putting away heavy sweaters and bringing out cute sandals. I did that this week, too. It's a sign of finally being able to say goodbye (and good riddance) to the worst cold snowy Winter we've had in recent memory. Today, the team of workers arrived to begin the extensive repairs on all the damage done to this old house during the winter. It's hard to be old. House or woman. Spring brings renewal of heart and home. Happy Spring to all! I tried Dior Lancome nearly everything. I do feel this one is really really good. It cheap as well!! !Give it try/ though maybe because I am not that old yet.